www.reneeruin.com was founded in 2009 as a platform to showcase independent and underground musicians, artists, fashion designers, writers, designers, creatives of all walks and culture as well as support incredibly talented women across all industries. 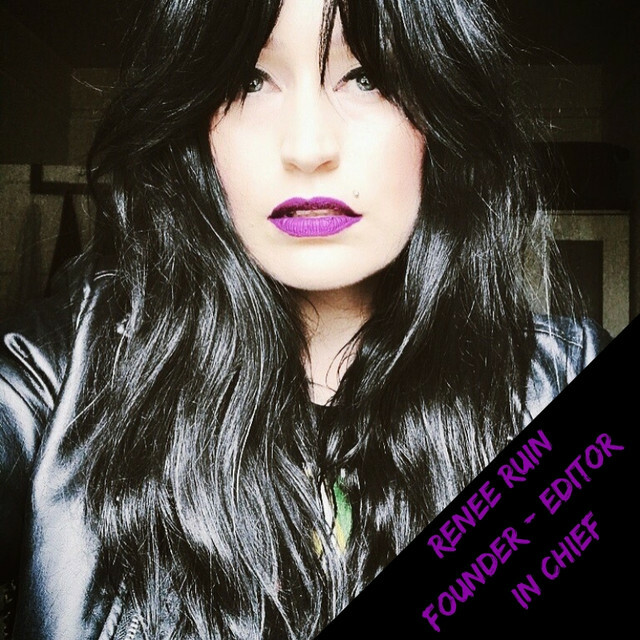 Renee Ruin has been a respected blogger in fashion, music and the arts both internationally and locally. She has featured and interviewed fashion designers, artists, musicians, authors and jewellers in her time and is well regarded across all industries as a connoisseur of the noir, avant-garde & the alternative. Her unique interviews and musician curated mixtapes by famous musicians such as Courtney Love and Shirley Manson have earned her high regard amongst the music community and musicians themselves for her forthright and honest journalism and loyalty to the craft. Over the years the website evolved from a simple blog into a full spectrum online publication featuring articles, exclusive interviews, features and the integration of RUIN RADIO which is a monthly mixtape which is curated by Renee Ruin and is also special guest curated by musicians. Just some of the musician curators who have participated are Brody Dalle, Shirley Manson, Chelsea Wolfe, Courtney Love, Alan Mcgee of Creation Records, Jarboe, King Woman, Zola Jesus, Tony Hawk and Heather Gabel. Renee has interviewed musicians in the past such as; Mark Lanegan, Jarboe, Heather Gabel of HIDE, Murder City Devils, Wesley Eisold of AN and Cold Cave, Deap Vally, The Bronx, The Gallows, The Black Ryder, White Lung, Dave Pajo of SLINT, White Lung, Death Valley Girls, LA WITCH, Plague Vendor, Vowws and the list continues to grow. Renee has interviewed artists in the past such as; Roman Dirge, Shae Detar, Krist Mort, Rita Minissi, Nona Limmen, Dylan Garrett Smith, Tamara Santibanez, Tom Bagshaw, Darla Teagarden, Elizabeth McGrath, Abbey Watkins, Mab Graves, Aunia Kahn, Ellen Rogers, John John Jesse, Rudy Fig, Patrick O'Dell, Gareth Stehr, Julia Deville, Charmaine Olivia, Angela Boatwright, Edith Lebeau. As well as regular articles and features, reneeruin.com also runs several series of interviews focussing on unique and talented women called "Who's that Girl? ", a regular "Featured Tattoo Artist" interview series and will be launching a new interview series in the coming months about Female Business Owners called "Women Who Rule". reneeruin.com makes a conscious effort to accept NO sponsored advertisements and NO paid sponsored content. This is not out ethos. This is and always has been a project of love and passion. reneeruin.com is one woman and one women alone, me. Help keep the DIY dream alive.